Navigating the world of Autism related services can be a daunting task. Behaviour consultants, speech/physio/occupational therapy, diet, respite, funding – it’s enough to make anyone’s head spin. 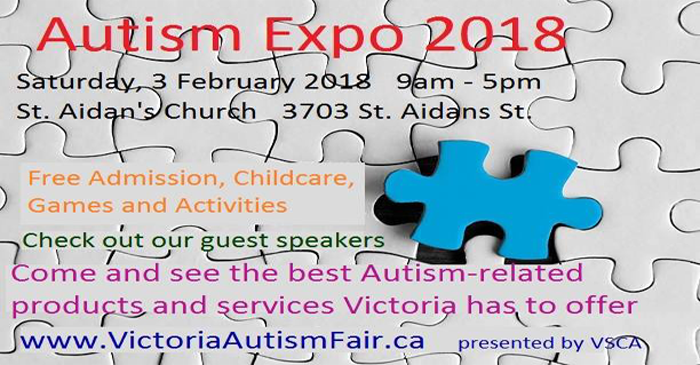 To help the parents of children and youth on the spectrum – whether they be newly diagnosed or not – VSCA (The Victoria Society for Children with Autism) presents the 2018 Autism Expo. Browse the many vendors, sample the services, connect with other parents, professionals or networks, or even participate in the games and activities! And limited childcare is provided as well! At 10:30 we present Bev Kissinger, the former head of Community Living Victoria – who will be discussing Representative Agreements (a simple and essential planning tool which can cover financial, personal and/or health care matters). Bev brings a lifetime of experience in the Victoria Autism community with her and is an engaging and knowledgeable speaker! At 1:00pm we are presenting Oscar Trad-Tizarro of Osanis Counselling and is a Seasonal Instructor at the University of Victoria, teaching “Disability and Child and Youth Care Practice” at the University of Victoria School of Child and Youth Care. At 3:00pm Teresa Everitt of Autism BC will be on hand to speak about transitioning to adulthood. Ms Everitt has spent most of her adult life supporting individuals with ASD to be the best they can be. Teresa’s presentation will be about “Launch Into Life” an innovative program that supports families to begin creating goals to prepare their youth to transition to adulthood. And many more speakers, products and services being added! Please check out our Facebook page here for late breaking news! This entry was posted on February 3, 2018 by Events Manager.